There are infinite number of dishes we can make with crepes. Starting from the appetizer to desserts there ample amount of items you can make, according to your taste and creativity. You can fill it with salad, make pizza crepe, dessert crepe, fruit filling or toppings whatever you like. But my first choice is always dessert, filled with custard cream and with ice cream which is sooooooo delicious and heavenly.. Again the crepe you can make very thin or bit thick whichever way you like. So today is my favorite crepe with custard cream to your visual. 1. Mix the eggs together with the sugar, vanilla essence and salt in a large bowl. 2. Add the sifted flour. 3. Mix until smooth, without lumps. 4. Add the milk little by little and melted butter mix well. 5. Heat the pan over moderate heat until it is very hot. Brush with little butter. 6. Pour a ladle full of batter . Tilt(rotate as if we do aapam) and move the pan so that the bottom is completely covered with a thin layer of batter. 6. Once it is cooked flip it over to other side till it is set and browned. 7. Proceed making with remaining batter. 8. Now crepes all ready and put it in fridge for just 1/2 or so. 2. Simmer the whole milk. Now add half or the milk to egg mixture, whisk again for about a minute. 4. Remove from heat, transfer to bowl. Cover with cling wrap and refrigerator until cool. 5. Now whip the cream until stiff peaks are formed by adding sugar to it. 6. Now whisk the cooled custard and fold in to the whipped cream and gently mix. 1. 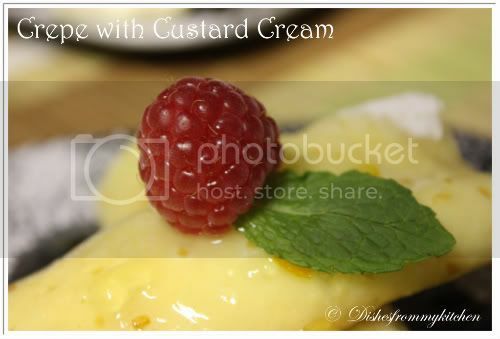 Place the crepe in a plate , add the custard 2 tbsp of custard cream gently roll. 2. Top with your favorite berry pr citrus sauce and garnish as you like or serve with fruits. 1. You can store your leftover custard cream in the fridge and make fruit desserts next day. 2. For making savory crepes just reduce the amount of sugar. WOW Very beautiful Pavithra... well presented. 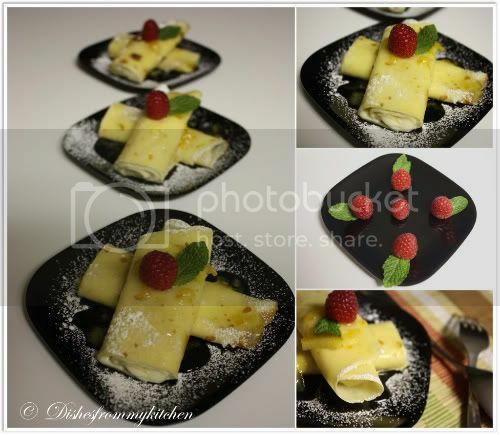 I like the presentation, and the crepes look fantastic..
Crepe looks so yummm..nice presention. nice soft crepes...v beautiful presentation as usual...! Simply delicious, beautiful eyecatching presentations and clicks. I've been thinking of making crepes for a long time now - you are inspiring me. This looks gorgeous as always and the berries kick it up so many notches! My favourite ..When we in US ,we used to eat crepe in IHOP ,its very delicious ..mouth-watering ...Extra-ordinary clicks ..
very new to me,looks sinful pavithra,wish to try out sometime! 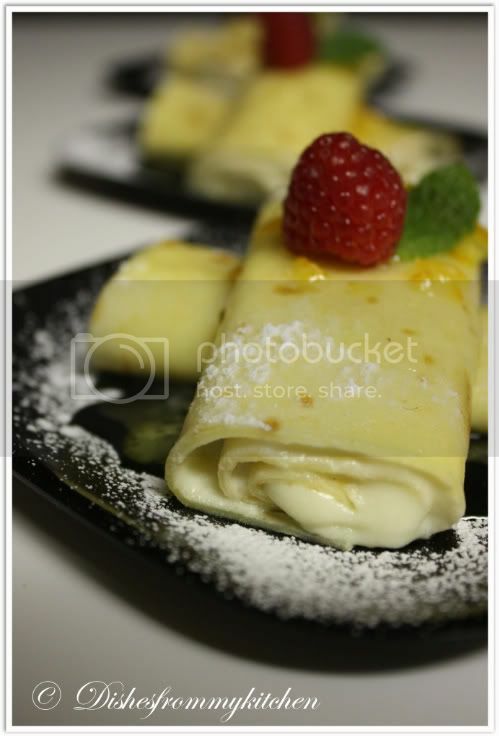 Slurp, i can eat many crépes with custard cream, such a tempting dish, do send these crepes to my event, if u interested dear Pavi..thanks..
Crepe looks so tempting and yummy!!! 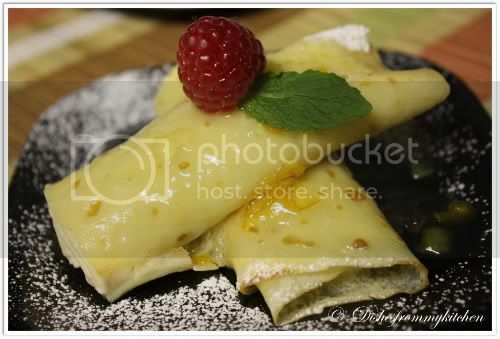 Adorable crepes ,very much fond of custard.What a decadent dish? You are tempting my taste bud pavi. This is pretty and yummy! Wow.. this looks way tempting :) yummm.. But mom will kick me if I use eggs on her pan.. he he..
Crepe looks absolutely delicious and beautiful. Nice presentation. Wow... Yummy anni... Looks mouth watering.... I want one rite now!!! 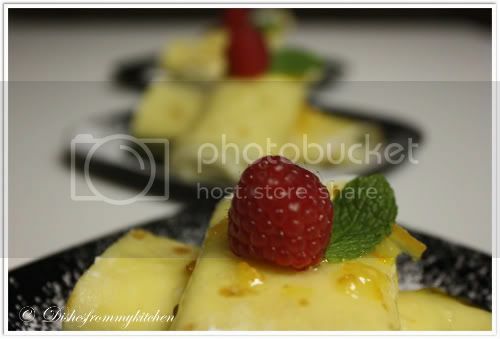 this is extra ordinarily mouth watering dessert and your presentation makes it even more . Lovely Crepe and awesome colour combination!!!! Looks so yummy and Inviting! Looks wonderful and delicious. Lovely presentation. irresistible pictures, tempting and delicious!!! i love it!!! When you click on the video you will see share on the right corner on top, click on link and you can share.